A foundation can be termed as shallow foundation when its width is equal or greater than its depth; such essential components of a building are placed just under the lower portion of column or wall. A footing is a structural member used to transfer load from column or wall over larger area to meet the bearing pressure requirements of subsoil. It may be constructed on brick work, concrete and composite materials. Footings are obviously oldest form of shallow foundation; more precisely then foundation meant shallow foundation. With the development of reinforced concrete, foundation constructed of masonry and grillage foundation were almost suppressed entirely. Before middle of 19th century, most footings were constructed with masonry; depending on size of masonry units they were called by different names, for example, if footings constructed of stone dressed and cut to desired sizes, it is called dimension-stone footings. Sometimes random sized rubble-stones are bonded by mortar to form foundation. Such footings were considered sufficient to support most of the structures until tall buildings were introduced. Heavy loads on column of tall buildings require heavy and large footing that will occupy valuable spaces in basement. The demand of large footing areas were increased self weight of footings which was first solved by introducing grillage foundation. 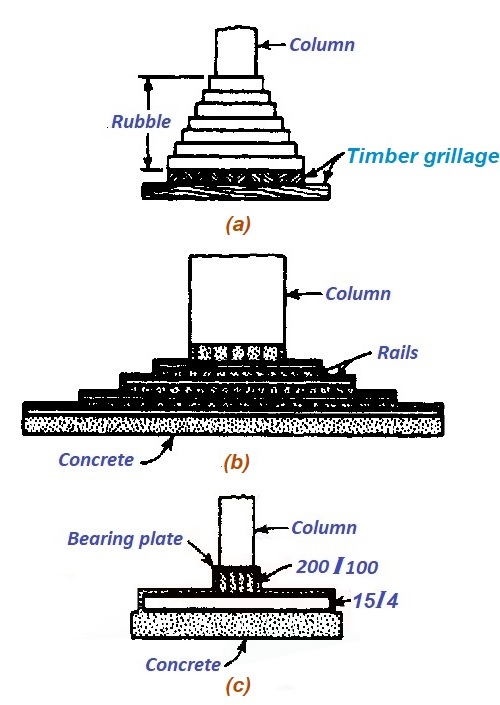 Usually timber grillages were supported by conventional masonry component of footings. Timber first replaced by steel rails (rail road rails) embedded by concrete in 1891. This rail grillage was then considered an significant improvement of grillage foundation as it reduced self weight of footings and furnished more spaced for the purpose of basement. Rail road rails were replaced by steel I-section to improve the cost effectiveness of the project but at cost of occupying some additional spaces. Steel I beams provided additional advantage by fulfilling the requirements of cantilever footings which was first used in 1887 in Chicago. Following figure shows different types of footings used in 19th century. On the arrival of reinforced concrete just after 1900, older footings described above were replaced by RC footings that still are dominating in construction industry. Footing is a foundation component which may be constructed of brick masonry or of concrete to support wall or column to distribute loads. directly above it over a large contact area. Sometimes footings are used as synonyms of shallow foundations. A foundation is a component of structure that is constructed immediately over ground surface to which column or wall loads to be transferred. 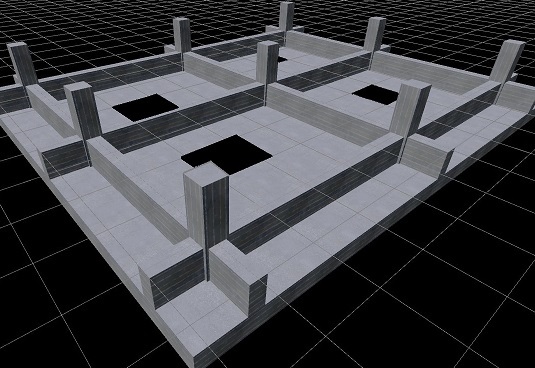 Many defined foundation as a group of footings that supports entire structure. The bottommost portion of a foundation is footing; thus it can be said that all footings must be a portion of foundation but all foundations are not footings. A clear reference is available in Australian building standard where foundations are defined as the strata or ground upon which footing is supported and it is not a component of building structure. In defining this, no foundation types like pad, strip or pile foundations are mentioned; as an example, when a pad foundation supported on clay soil, interestingly it is explained that pad footing supported on clay foundation. It is very much confusing for you even to me, but it is true. It totally changes every regular concept about foundation, say when we are talking about settlement of foundation we have to consider only settlement of soil or other founding materials. In general, a foundation of structure may have one or more footings may be of same size/shape or different based on loads on individual footing. A foundation is a load bearing component of building which consists of group of footing set at the bottommost portion of it. Footings are predominant structural component of shallow foundation which may be of spread footing, cantilever footing, strip footing and combined footing which may be called raft when it covers large area of structure. The term foundation may be used for both deep and shallow foundations which sometimes don’t have established footings like caissons, well foundations, micropiles etc. This is also known as isolated footing. This footings are selected to support an single column; very often they are square in shape and supports single loaded placed directly at the center, if there have not any space limitation. But depending on position of column relative to property line and spacing between adjacent columns they may be rectangular and circular. Usually the footings have uniform thickness but there have some exceptions. The footings for a circular column may be either circular or square while calculating stresses on foundation slabs, the circular column is treated as square column of equivalent area. In case of circular footings the basic design principles are followed. It is recommended that footing thickness at the edge should not be less than 6” [when footings supported on soil]; in case of footing supported on piles, this thickness should not be less than 12” above the top of piles. As discussed above, having single slab is the simplest form, but there may have a cap or pedestal constructed between slab and column. The purpose of pedestal are to provide a sound load transfer medium and in some cases it will furnish required development length for dowels. This form of column footings is called stepped footings. Every components of stepped footing should be constructed at a time to establish monolithic action. This footings have simple slabs but this slabs are sloped to the edge. This saves concrete relative to steeped footings. But additional cost involved for extra labor to make slopping surface (including formwork), usually stepped footings are found economical considering both factors. Generally column footings having slab are economical up to thickness of 3 ft.
Wall footings are usually used for load bearing walls. They are usually reinforced concrete long member having shallow depth are uniform width. When columns are spaced too closely to accommodate column footings, strip footings can also be used; accommodation means not overlapping of footing, not touching or nearly touching each other. Number of closely spaced column footings are considered not economical as compared to strip footing. Strip footing is often termed as continuous footing. Wall footings may be of plain cement concrete (PCC) or reinforced concrete; PCC strip footings are chosen for lighter structure and where soil condition is favorable. When soil has low bearing capacity and structure exerts relatively high pressure, PCC footings are uneconomical and replaced by reinforced concrete footings. In plain concrete footings, the minimum thickness of the footings should be kept 150 mm; which is further increased to 300 mm in case of cohesive soil to counteract swelling pressure. The thickness of the footings at any section should be enough to counteract tension developed on underside of footing (act as cantilever). The reason why plain concrete footings are uneconomical; is they require thick footings; usually thickness is kept two times the length of projection form the face of wall; 450 distribution of load is very common which reduce tension stress underside. For thick footing having large projection, sloping upper surface can be provided for economy of the project; though additional cost for form work should be considered in estimate. In case of heavily loaded walls supported on weak ground, reinforced concrete strip footing is recommended. The thickness of footings is determined based on bending moment and shear applying proper factor of safety. Strip footing is one type of combined footings which can support more than two column. Strip footing supports a row of columns. When closely spaced rows of column can not be accommodated without overlapping, strips are provided along both directions. The former combined footing is known as continuous strip footings and the later is known as grid foundation. Except space limitation between columns, sometimes there may have to place column to property line, which also requires combined footing like strip or grid foundations. 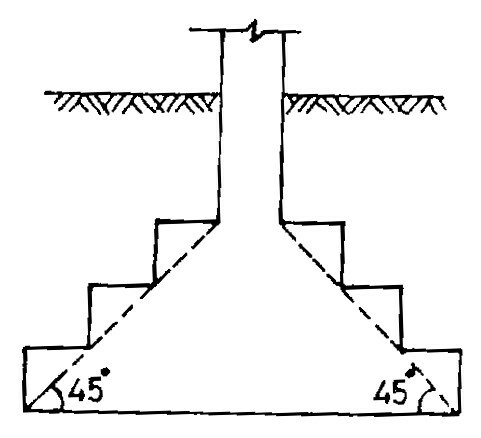 Strip footings will produce more bearing area yielding less bearing pressure at the bottom of footing which will often result a more economical footing relative to single column footing as strip are treated as continuous beams that will subjected to significantly smaller cantilever moments than that appear in wide single footings that are projected far away from the column face along all directions; it should keep in mind that critical sections for moment lies at face of column. Combined footings can be categorized based on number of columns, they are footings supporting two columns and that supports more than two columns. strip footings are of second category. 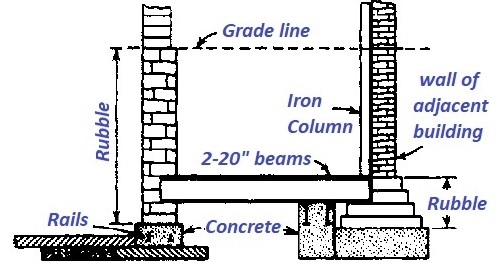 Two column footings may be further categorized based on their geometric shapes and based on connection between columns. In designing any type of combined footing, it is desired to induced uniform bearing pressure under entire area of footings, so that any tendency of tilting is prevented. To achieve this centroid of selected footing area should coincide with resultant of column loads. The area of two column footings in plan may be set to rectangular, T-shaped or trapezoidal for this purpose. Another method that can be used successfully when an individual footing can not support an exterior column at its center, is to put external column on footing eccentrically and to bridge with a nearby interior footing by placing a strap or in simple word a beam. With the help of this strap tendency to tilt of exterior eccentric footing is counterweighted by load of interior column (usually interior column is loaded heavier than exterior column). This footing is termed as strap, connected or cantilever footing. with column load. But in case of exterior footings resultant of upward pressure and load are not collinear and produce a couple that balances the stress resulted from eccentricity of column with respect to exterior footing area. the interior footing is loaded centrally. This is one type of combined footing which covers total area under a structure to support all columns and walls. Raft foundation is selected where structural loads are too heavy or bearing capacity of soil is too small to be supported by individual footings without overlapping. 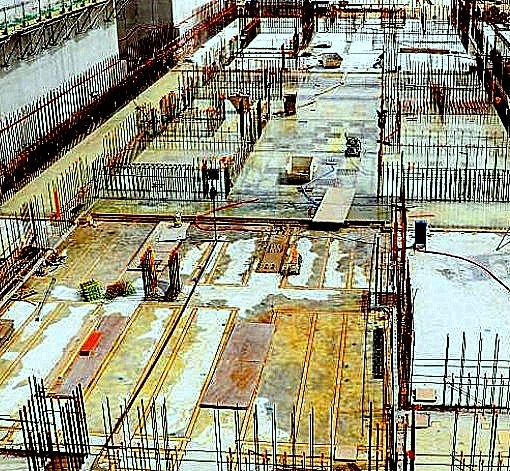 Sometimes grid foundations are not enough to support structure without overlapping projected slabs from continuous beams, in that case raft foundation is the only solution except for deep foundation. It is found that when required footing areas exceeds half of plinth area of building, raft foundation is the economical solution. Raft foundation is also a good solution to control or reduce settlement of building founded on highly compressible soil. Sometime the depth of foundation is increased to partially or fully compensate weight of foundation and structure. When column loads are significantly uneven or it is suspected to have deposits to suffer large differential moments, large rafts should be stiffened to impede excessive deformations. In this purpose, a stiffener partitions can be provided to become stems of Tee beams monolithic with raft slab. Thus a rigid frame or cellular foundation are formed; sometimes by using stiffness of RC superstructures, this purpose can be achieved. When foundation is very large, the stiffening work becomes more expensive and sometimes pile or other deep foundations are considered more economical than raft foundation.